Hailing from a family who has been active in the industry since its inception, Olivier has an outstanding barging pedigree, having grown up on the French canals. He offers uniquely intimate insights into the world of barging, and thrives on introducing guests to canal cruising. Deb’s barging background is equally as impressive, as she honed her hospitality skills on the inland waterways of her native Britain. This dynamic duo met as crew on a barge cruise, and the rest is history. Between them, they boast decades of experience working aboard luxury barges in all positions: Chef, Captain, Tour Guide, and Hostess. 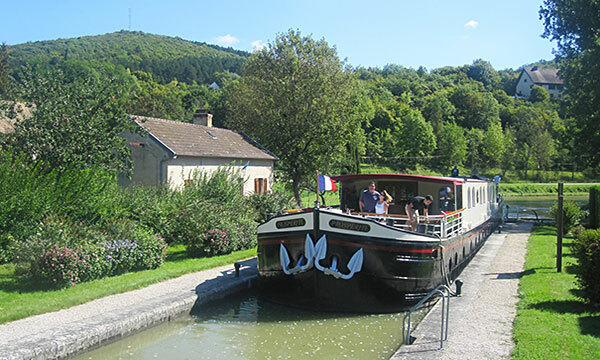 Their handsome barge welcomes guests to four of the most spacious and luxuriously-appointed cabins on the canals, a wonderful amenity for those to whom personal space is paramount. Culinary delights reveal the region’s abundance of food and wine; locally-produced champagnes, many from the area’s celebrated vineyards of Epernay, are perfectly paired with seasonally inspired gourmet cuisine. 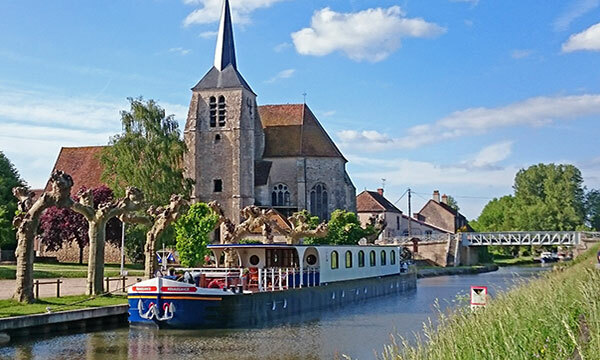 Guided excursions to the area’s champagne houses, military monuments, and local landmarks encourage guests to explore Champagne’s best sights and scenes. In the afternoon, you will be met by a crew member of the C'est la Vie at the designated meeting point. From here, relax as you are chauffeured to the barge, moored in the city of Meaux. A traditional champagne welcome and introduction to the crew awaits you, before your first of many gourmet dinners onboard. A morning cruise begins the day. Relax on deck, or explore the towpath with a gentle pedal or leisurely stroll. This afternoon, a visit to the Chateau of Vaux le Vicomte reveals an enormous privately-owned property, festooned with grand gardens and harboring an intriguing history. Built by Nicholas Fouquet, finance minister to Louis XIV, the chateau's grandeur enraged the jealous King. Fouquet was jailed for the rest of his life, and the King built Versailles in retaliation! Return to the C’est la Vie for drinks and dinner. This morning's lazy cruise drifts through a gorgeous landscape of villages, vineyards, pastures, and forests. Enjoy a cup of coffee on deck and watch the scenery slip by. This afternoon's excursion is to the nearby Belleau Wood, the scene of the second battle of the Marne in spring 1918, which ended the last German offensive of WWI. Overlooking Chateau Thierry is the massive French-American Friendship Monument and the Aisne-Marne American Cemetery. Return to the C'est la Vie where Chef is crafting another gourmet dinner. A morning cruise begins the day's many epicurean adventures. Bottoms up this afternoon! 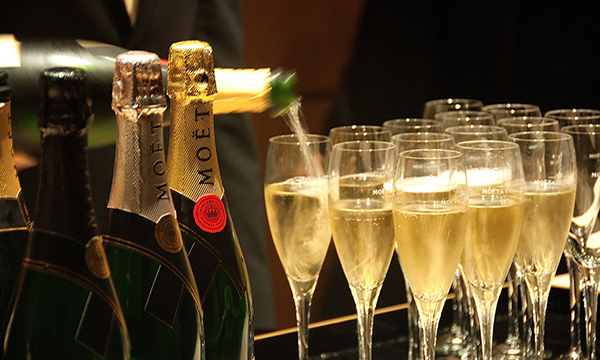 Your Tour Guide escorts you to the famed champagne producer Moet et Chandon in Epernay. Enjoy a tour and tasting at this iconic champagne house. Next, visit Hautvillers, a charming village perched high over the expansive vineyards. Explore the unassuming church of monk Dom Perignon, who is credited for having "discovered" champagne. Cheers to Dom Perignon! Tonight's dinner is very special, as it is taken ashore at Les Crayeres, a 2-star Michelin restaurant. This morning, the C'est la Vie floats off the Marne River to continue her journey on the Canal Lateral a la Marne. This is the perfect time to explore the towpath's flora and fauna with a gentle pedal or leisurely stroll. This afternoon, meet and greet the local "champagnois" as your Tour Guide accompanies you to a local family-owned vineyard. A private tour of the property precedes a special tasting of their champagnes. Return to the barge and socialize in the salon or on deck while Chef puts the final touches on tonight's dinner. This morning's cruise through a flight of locks offers the final opportunity to enjoy a brisk walk or bicycle ride along the towpath. This afternoon, your Tour Guide escorts you to the Reims Cathedral. Explore the magnificent church where the Kings of France were crowned; Marc Chagall designed the stained glass installed in 1974 in the axis of the apse. Afterwards, stroll the streets of the pedestrian area, or enjoy a coffee in the town square. Tonight, canapes and cocktails precede the Captain’s Gala Dinner, ending your cruise in style!